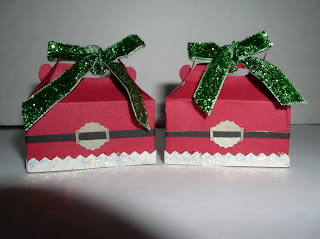 I made these little Santa gift boxes after seeing a picture in one of my Oriental Trading mail order catalogs. 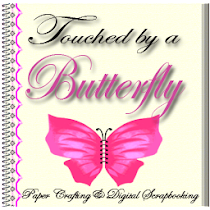 I cut them out on my Cricut Create and used the box cut from my CTMH Artiste Cartridge. I used my Art Philosophy cartridge to cut out the belt buckle and the trim around the bottom of the box. The green ribbon was from my stash and to make the belt I just cut small strips of paper. My Cricut would only allow me to cut them out at 2” but I think they will make cute ornaments for my Christmas tree. Making these little boxes have given me an idea for something else. I will try it out and if it turns out good I will come back and post it on my blog.